You know those books that make you cry in public? 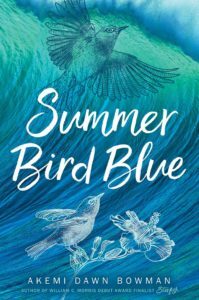 Meet my book – Summer Bird Blue. At this point Akemi Dawn Bowman is one of m auto-buy authors. I pre-ordered Summer Bird Blue before I even got my e-ARC of this. And then life got tremendously messy so I wasn’t able to review it before publication, but I have since then listened to the audiobook and kicked myself every day for not having read this sooner. Rumi is struggling with the death of her sister and its raw, touching, and genuine. Both her and her mother are reeling from their grief, coping in their own ways, and when Rumi is sent to live with her aunt in Hawaii it all comes to a crescendo – about how Rumi always felt like her mom loved her sister more, how alone she feels in Hawaii, and how unmoored she feels without the music to ground her. Rumi has to be in my top list of favorite main characters in YA literature because in every moment, her darkest days, her worst mistakes, and her happiness, I couldn’t stop reading. She struck a chord within me – how she felt so alone, so set out to sea. Not to mention Rumi is struggling with her ace and aromantic identity and it was so clear on the page! Talk about representation I can get behind. As a whole Rumi is really struggling with who she is – without her best friend Lea, without the music thrumming through her veins, with her mother and all those unsaid words, and with her identity. In general the entire family relationship and structure were so fascinating to read. If you’re a sucker for family stories then you definitely have to read Summer Bird Blue. It’s a book about grief, sisterhood, but also being pulled in all these different directions at one and being totally unsure of who you are. It’s also about the moments afterward, the process of moving on, finding the little bits of yourself strewn about. Grappling with all these memories of the past, our regrets, and our loves. The times we said things we regretted, not saying enough, and words hung in silent echoes and fallen in the chasms of commas. Summer Bird Blue is about love that hollows us out, that takes the very marrow from our bones, that exposes the parts of your heart and mind you can’t bear to see, but it also brings us happiness, fulls our lives with sunshine, and supports us when we are at our worst. Find Summer Bird Blue on Goodreads, Amazon, Indiebound & The Book Depository. Who is your top five favorite main characters in YA literature? I love family stories! This book sounds perfect for me to read. I’m so sorry to hear that and I absolutely empathize with why it would be an emotional read – the pain of not being able to say goodbye and those last moments are so important to the book. And it’s a hard book about grief and how it rears its head long after the initial moments.